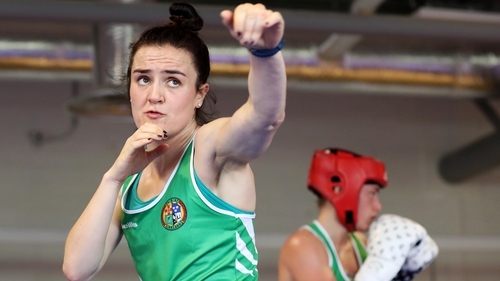 World No 2 ranked Kellie Harrington has received a bye into the lightweight final at the first of the 2018 National Elite Championships. A second Championships is pencilled in for November 2018 to facilitate athletes going into the qualifiers for Tokyo 2020. The Dubliner, who reached the 2016 World Elite light-welter final in Kazakhstan but who has since dropped down to lightweight to fill the position vacated by former Olympic lightweight champion Katie Taylor, meets Dundalk southpaw Amy Broadhurst in the 60kg final later this month. Broadhurst is a former European Junior and Youth champion. Ex-World Junior champion and Olympic Youth finalist Ciara Ginty faces Gillian Duffy in the welter semi-finals on Saturday week. London 2012 captain Darren O’Neill, the defending heavyweight champion, has withdrawn from the tournament with a hand injury and current European Elite gold medallist Joe Ward will not defend his light-heavy title as he has signed with the British Lionhearts in the World Series of Boxing. The Westmeath southpaw lines out for the Lionhearts versus the Croatian Knight in Newcastle on February 16. The 2018 Championships begin Friday at the National Stadium in Dublin when 15 bouts will be decided. Galway’s Patrick Mongan is in against Dillon Duffy in the first of the lightweight quarter-finals. Mongan, who boxes out of the Olympic BC, convincingly beat Russia’s Vladmir Nikitin, who received a highly controversial decision over Ireland’s Michael Conlan at Rio 2016, at the National Stadium last year. Former Elite champion Dean Gardiner faces Dublin super-heavy Thomas Carthy for a place in the last-four.